I am a huge fan of the Audemars Piguet Royal Oak Extra-Thin, or as it was called before 2012, the ‘Jumbo’. It was actually one of the watches that sparked my interest in mechanical watches in the mid 1990s. Today, I talk you through the new reference 15202BA.OO.1240BA.01, the yellow gold Royal Oak Extra-Thin in yellow gold to commemorate the 40th anniversary of the first model in this precious metal. You all know the story. 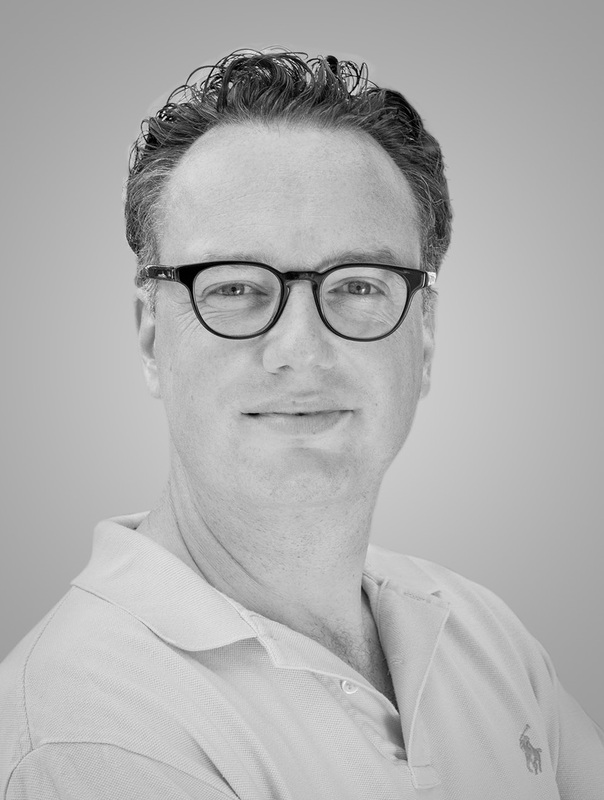 Gérald Genta designed the Royal Oak for Audemars Piguet, based on the port holes of the HMS Royal Oak vessels. The name Royal Oak originated from the sacred tree that hid King Charles II of England and protected him from his pursuers in 1651. 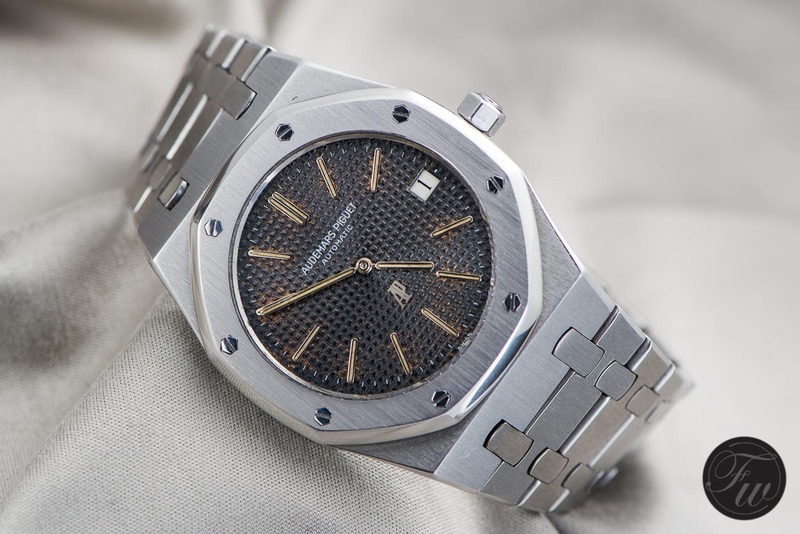 In 1972, Audemars Piguet introduced this Royal Oak watch at the Basel watchfair for a price of 3000 Swiss Francs. An amount that would buy you about 10 Rolex Submariner watches back then. A crazy amount of money for a watch in stainless steel. Marketed as a luxury sports watch, but not really meant as a sports watch, of course. More background information about the Audemars Piguet Royal Oak (Extra-Thin / Jumbo), can be found here. It all started with the reference 5402ST model, A-series, for connoisseurs. We covered the A-series not too long ago, in this article. Actually meant for the Italian market, but the watch was picked up by many (fortunate) enthusiasts around the world. It obviously was the inspiration for a number of other watches from that era, like the later IWC Ingenieur (Genta), Patek Philippe Nautilus (Genta), Vacheron Constantin ‘222’ (Hysek) later known as Overseas and the Girard-Perregaux Laureato (designer not known) for example. Some of these watches shared the same movement of the Royal Oak 5402, the JLC 920 based calibre 2121 movement. 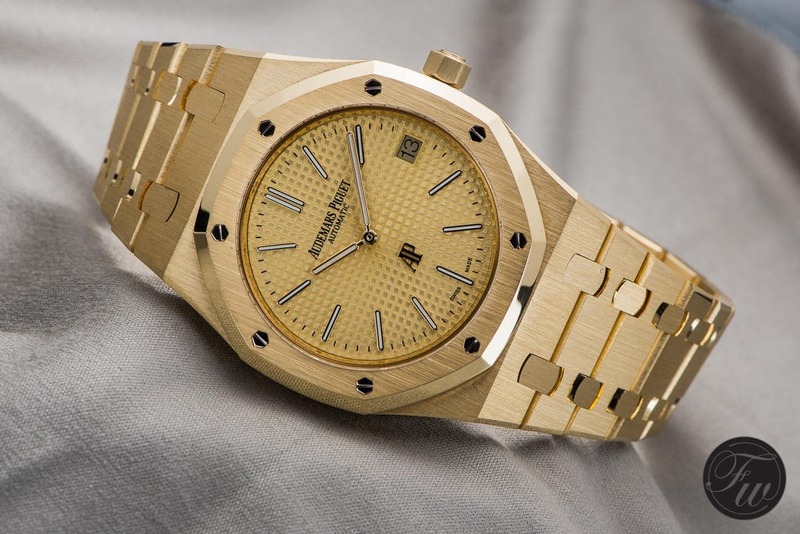 It wasn’t until 1977, when Audemars Piguet decided to manufacture their Royal Oak 5402 in yellow gold. They let go of the idea of a luxury sports watch in stainless steel, and decided to offer it in a precious metal as well. Below, an example of one of those early 5402BA (BA stands for gold in their reference coding system) models. Photo by the guys from Analog Shift. Later references for the Royal Oak Jumbo, like the jubilee reference 14802 and later reference 15002 also were offered in yellow gold. Today’s reference is the 15202, which was also the reference number before the major update in 2012 for its 40th anniversary. Before 2012, Audemars Piguet also had a 15202BA (yellow gold) in their collection. After 2012, with the change of the dial (“Petite Tapisserie”) and AP logo at 6 o’clock, Audemars Piguet offered the 15202 in rose gold (15202OR) besides the stainless steel reference. This year, at the SIHH in Geneva, Audemars Piguet also released their Royal Oak Extra-Thin in yellow gold (again). 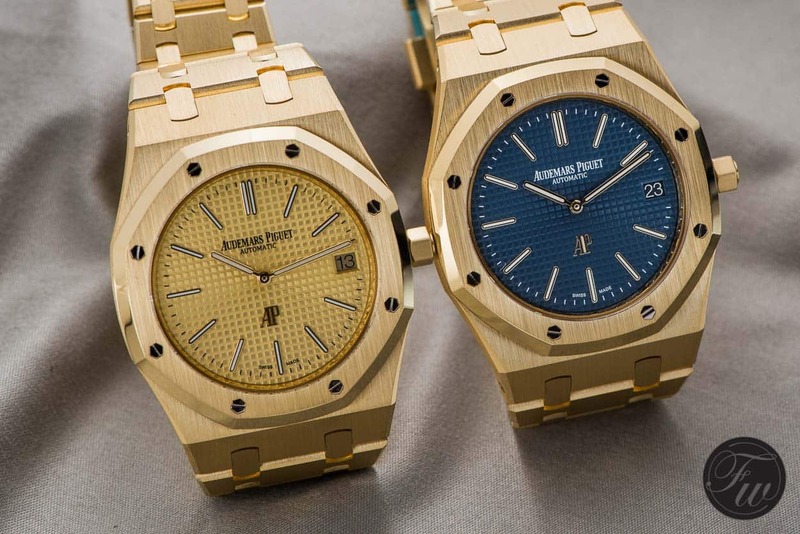 In two different versions: one with a blue dial and one with a champagne dial. I must admit, I was smitten by the champagne dial version from the first moment. This ‘gold-on-gold’ looking version is simply amazing. To my best knowledge, and as far as I could find in books and via search engines, there was no Jumbo or Extra-Thin before with this dial configuration. Previous editions always had the charcoal/grey-blue or silvery-white dial. I used to have a Royal Oak 15300ST (three-hand version) and a Royal Oak Chronograph 26300ST and while these also measured 39mm, they are quite a bit thicker than my 15202ST. Personally, I think all other versions of the Royal Oak than the 15202 (or its predecessors) are bit ‘off’ due to the fact that the original dimensions are gone. They are either a bit too thick, too large or have bracelets that are too thick. That is all very personal of course, but the power of the iconic Jumbo (or Extra-Thin) is that the design is spot on. Mess with that, and you will always find nitpickers like me that are a bit too obsessed about details. The gold version has the same dimensions as my own steel 15202 (from before the 2012 update). For the case that is, as Audemars Piguet changed the bracelet a bit on the new post-2012 models. The watch is like silk on your wrist, and the thin case is truly a joy to wear with shirts and cuffs. Due to the sportiness of the watch, it doesn’t have this usual ‘dress watch’ appearance like most other ultra-thin watches have. The case of the 15202BA.OO.1240BA.02 (15202BA.OO.1240BA.01 for the blue dial version) is 8.1mm thick and measures – of course – 39mm in diameter. What differs – besides the color of the material – is of course the weight. 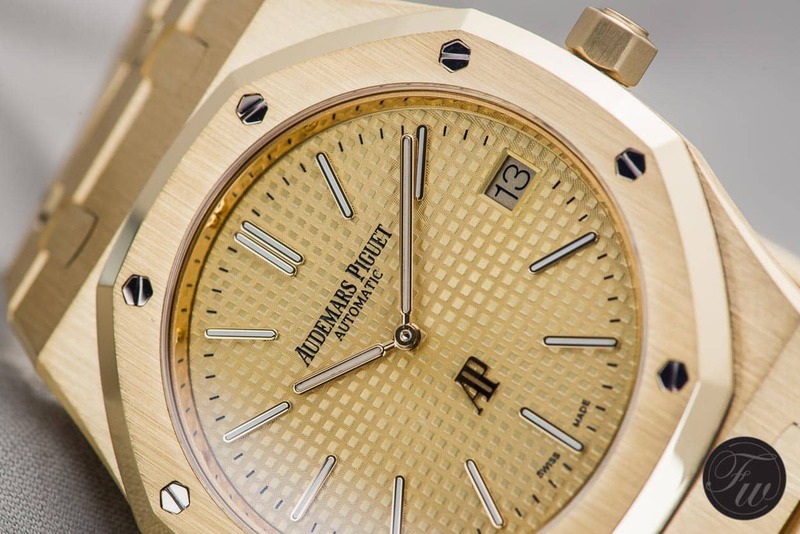 The Audemars Piguet Royal Oak Extra-Thin in yellow gold weighs significantly more than its stainless steel version. Although I love the 15202ST on the wrist, the gold version surely has more presence. Not only due to the color but also due to its weight. You will notice the watch all the time, which gives a reassuring feeling I have to admit. 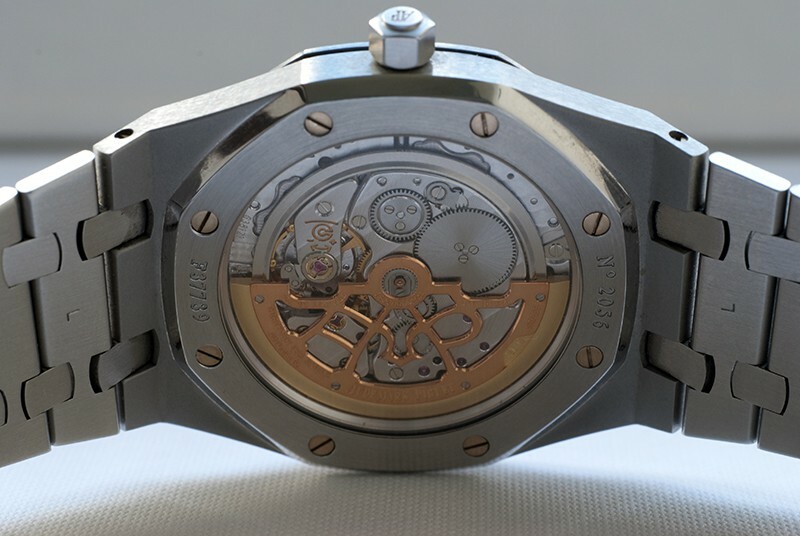 One of the reasons for this Audemars Piguet Royal Oak being extra-thin, is of course the movement calibre 2121. This movement from the late 1960s, based on Jaeger-LeCoultre calibre 920, has been used ever since the Royal Oak was introduced in 1972. It is a very flat movement (3.05mm), mainly because of the lack of ball bearings. Instead, the rotor glides on this rail that ensures a rather thin overall package. This movement, with its Gyromax balance and beautiful finish, is definitely my favorite automatic (time-only) movement. I’ve written a couple of stories on this movement in the last 12 years of running Fratello Watches, so I don’t want to keep repeating myself all the time, but it is really a joy to look at. 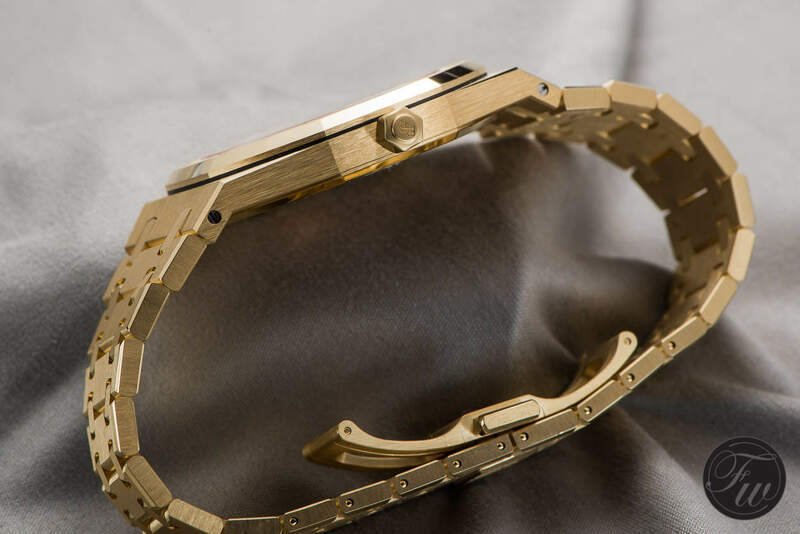 From what I understood from their previous designer, Octavio Garcia (who I interviewed here, during the Royal Oak exhibition in Paris), the calibre 2121 underwent through some small changes over the years. It is indeed the same construction and design as those used in the very first 5402 A-series, but along the way there have been made some changes. For the eyes, at least the rotor changed drastically. My own 15202 has a very different rotor from this particular one. To me, part of the fun in owning this watch is definitely in the movement. As I wrote above, I used to have the 15300 with calibre 3120 movement, and decided to trade-up at some point for the Jumbo. For me, the 15202 (or one of its predecessors) is the real deal due to the movement and due to that, the perfect dimensions of this watch. I am happy to see that the new Audemars Piguet Royal Oak Extra-thin in yellow gold is no different. 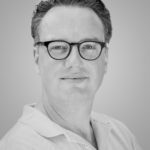 The SIHH 2017 was a bit boring to be honest, as I explained in the first paragraph of this article about the A. Lange & Söhne 1815 Annual Calendar. Also our friends James Stacey and Jason Heaton of The Grey Nato discussed this in their SIHH field report. In the high-end segment, to which I definitely count this Audemars Piguet Royal Oak 15202BA, there wasn’t much wrong to be honest. In the ‘entry-level’ up to 10.000 Euro (I know, still relative but keep in mind this is the ‘haute horlogerie’ fair) it was quite very boring. Besides the Lange 1815 Annual Calendar, this Audemars Piguet Royal Oak Extra-Thin in yellow gold is definitely among my SIHH favorites. Even though Audemars Piguet only changed the material (there was already a rose gold for this specific reference and there was a pre-2012 version in yellow gold), this watch gave me a thrill. As a side note, I feel sorry for brands like Baume & Mercier and Montblanc, that have no real iconic piece which makes it hard for them to come up with something distinctive. Anyway, the choice of dials is simply amazing for this yellow gold Audemars Piguet Royal Oak Extra-Thin 15202. The blue version give a really nice contrast to the yellow gold while the champagne dial gives it a more ‘mono’ look – which I like. At first, the champagne dial seems to be a bit ‘too much’, but when I tried both versions, I couldn’t help myself liking the champagne dial a bit better. But to each his – or her – own of course. Both dials have the amazing “Petite Tapisserie” pattern, which can be admired on some of the close-ups that Bert made during the photoshoot. The applied hour markers and hands are coated with luminous material and give this amazing ‘classy’ look in low-light conditions. I really love my 15202 when it gives that slight glow with its long stick markers. Only few watches can beat that appearance. 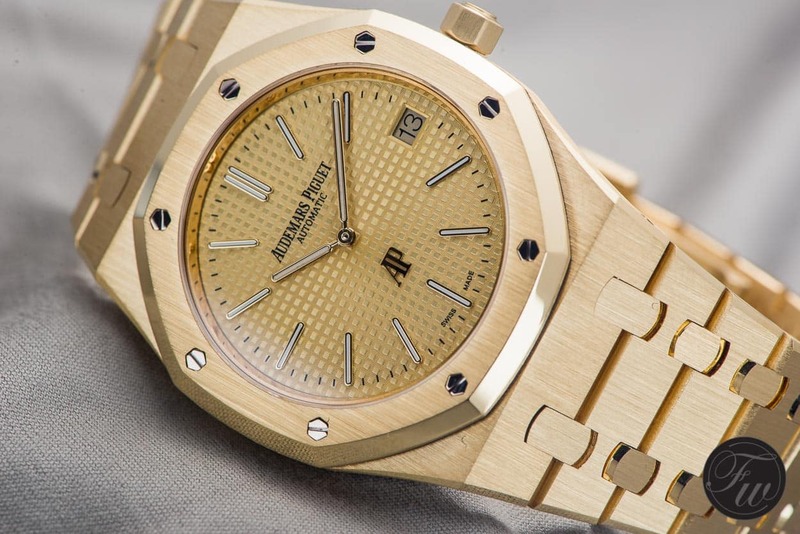 One of the comments I heard and read about this Audemars Piguet Royal Oak Extra-Thin in yellow gold is that it will collect scratches even more than its steel brothers. My 15202ST is indeed a scratch magnet, even though I rarely wear it. It has dings and scratches on the bezel and a number of scratches on and near the clasp. Due to the matte brushed surfaces on the watch, these scratches do catch a lot of attention when you look at the watch. On the other hand, watches are there to be worn and these scratches at least give the watch a bit of character. 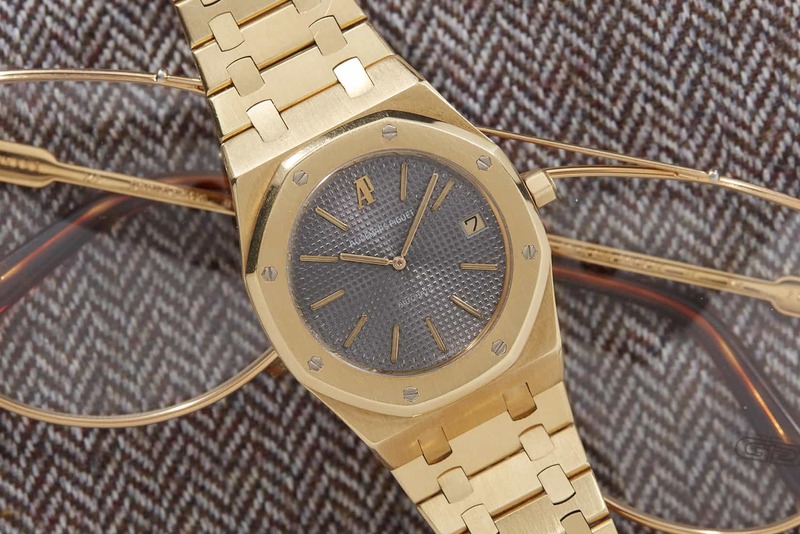 If you like to baby your watch, I am not sure if a steel – or gold – Audemars Piguet Royal Oak Extra-Thin is the way to go for you. Every scratch might result in a slight panic attack. I noticed that even some of the brand new Royal Oaks that we had for our photoshoot in Geneva already had some marks on them. Second day of the show. The price of this gold goodness is $55,400 USD, regardless of the dial color you will choose. That is a serious amount of money. I remember that, in 2010 or so, I was in Paris at one of the Audemars Piguet dealers at the Place Vendôme and they offered a 15202 in gold for 32.000 Euro. That was already quite an amount of money for the 15202 in gold, as the stainless steel version had a list price of (then) around 15.000 Euro. I think now it is just above 20.000 Euro for the Audemars Piguet Royal Oak Extra-Thin in steel. That is a lot of money for a two hand watch and 55,400 USD for the gold version will also buy you a watch with some very decent complications. Do I find it worth it? I truly love the yellow gold 15202, despite the high price tag. 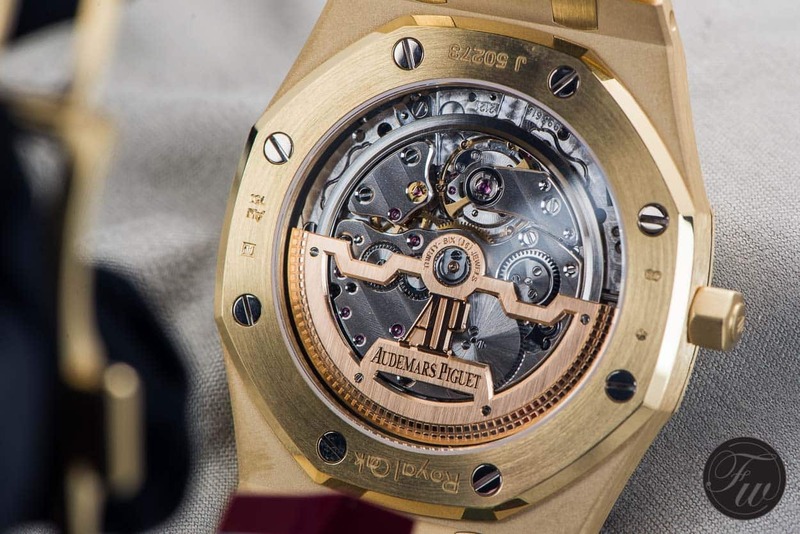 It is probably also part of the luxury and exclusive image that Audemars Piguet likes to stick to. I don’t feel the mark-up for gold should be that high to be honest. But I see the same happening at other brand (which still doesn’t justify this). However, I think there will be enough people who don’t care about this and still want one. It is the attraction that Audemars Piguet has I guess. I can only dream about having such a gold piece in the future, but until then I will cherish the stainless steel 15202 that I have. More information via AP on-line. Caliber 2121 in the gold version.